What should I say to someone to convince them to install solar panels in their home? How can I persuade someone to consider vegetarian food? What are the challenges in getting someone to buy fewer clothes? Everyday sustainable practices can be easy, simple activities. Even seemingly small changes are effective, especially when shared by many people. Innovative solutions require appropriate ways of marketing them to consumers. It is imperative to find the right arguments, those that will resonate with the consumer and address concerns they may have. This report and the accompanying workbook provide the practitioner with the right tools for this job. 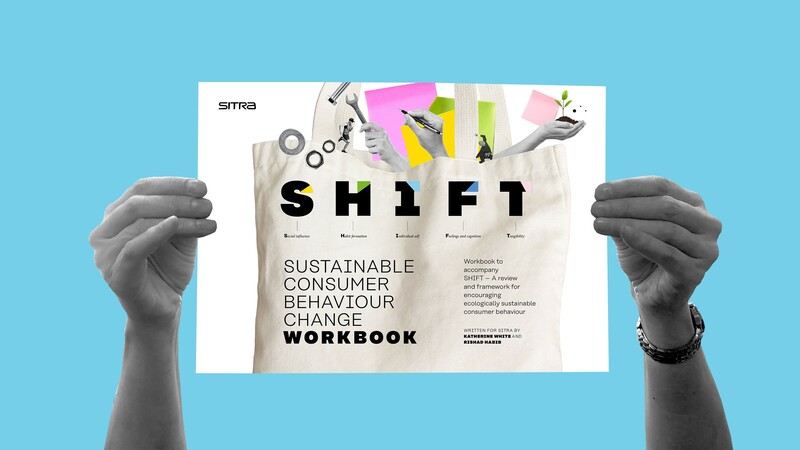 This workbook is a companion to the report SHIFT – A review and framework for encouraging ecologically sustainable consumer behaviour (Sitra Studies 132). The workbook presents a set of tools that practitioners can use to foster ecologically sustainable consumer behaviour.